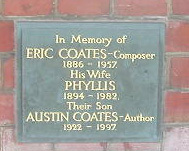 how to promote the music and history of Eric Coates. 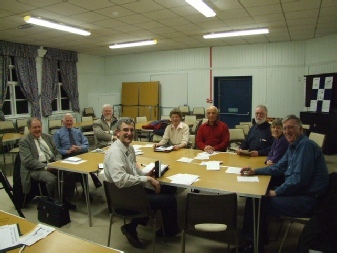 At the invitation of Ashfield District Council Heritage officer Denis Hill and Hucknall Tourism and Regeneration Group, a meeting was arranged to take place at the Watnall Road Community Hall in Hucknall on Wednesday 27th February 2008. The Hall was previously St.Peters Church and stands next door to where Eric Coates was born on August the 27th 1886. 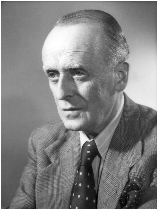 The Eric Coates Society is promoting his music and history and we welcome any one who shares our enthusiasm. Please use the ground floor entrance. Throughout the year, please contact us for current dates. 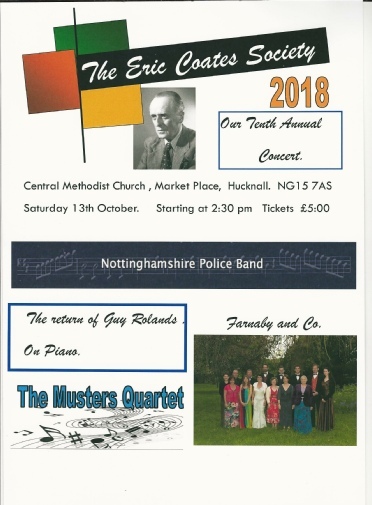 We have also hold a concert each year in Hucknall around October at the Central Methodist Church, Baker Street in Hucknall, NG15 7AS which are very well attended and usually a sell out. play some of his music and some of there own choosing to balance the programme. Past performers include:-Nottinghamshire Police Band,The Boots Orchestra, Nottingham Concert Band, Local Brass Bands and choirs and even the local Holgate Academy provided some ballet dancers to perform to some of Coates music. 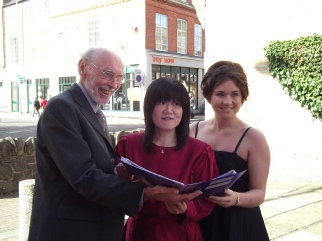 How can we forget the piano performance of Haruko Seki, and the performance by Laura Roberts and Michael Neaum of three previously unpublished songs by Eric Coates. Guy Rowlands and (the now late) Peter Dempsey wowed us with their rendition of Coates’ songs and Bob Reed gave us a refreshing example of modern swing numbers. Please see the past programmes on the home page for more details. At The John Godber Centre. An ongoing project to investigate the feasibility of commissioning a statue of Eric Coates to be erected here in Hucknall is still in mind. ‘King of Light Music’ Statue or Bust made. The sculptor who worked on the Kirkby Bronze is called David Annand. Follow the link to look at some of his work.  Let us know your thoughts through the contact us page. 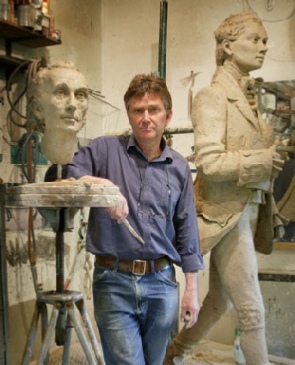 Another suggestion is to ask the sculptor Graham Ibbeson to consider a Statue or Bust. 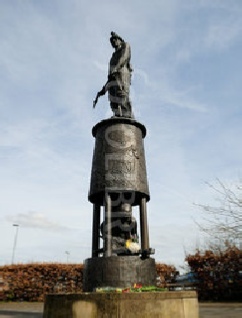 Graham will be remembered for the Miners Statue on Station Road. Follow the link to see some of Graham’s work. Another suggestion is to ask the sculptor Neale Andrew to consider a Statue or Bust. 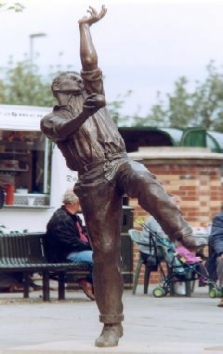 Neale is known for his bronze at Kirkby in Ashfield, Notts. Follow the link to see some more of his work. and also the 20th anniversary of his son Austin’s Death.